Thanksgiving brings families together, provides a chance to express our thanks and gratitude for the blessings bestowed upon us, and leaves the refrigerator full of leftover food. In fact, leftovers are almost as much a part of this well-loved holiday as mashed potatoes and cranberry sauce. But you can only eat so many turkey sandwiches before your taste for turkey begins to wane and Thanksgiving tends to fill the fridge with more than just leftover turkey. Leftover turkey can be a great base for soup. You can cook up a batch of hearty Cream of Turkey and Wild Rice Soup and freeze it in individual portions for a quick, homemade lunch. Make use of some turkey and left over squash by making Turkey and Squash Soup, perfect for anyone who is watching what they eat. Warm up cool nights with White Chili made with leftover turkey. While traditional Thanksgiving dinner dishes may not feature those fantastic Southwestern flavors Arizonans love so much, the meals you make with leftovers absolutely can. Try Mexican Turkey which infuses some local flavor into your leftover turkey. A big bowl of Turkey Tortilla Soup will warm up even the chilliest night and Four Seasons Enchiladas are simply packed with fabulous local flavors. For a quick lunch or a lunch made from leftovers you can create Crispy Turkey Tostadas or Shredded Turkey and Pinto Bean Burritos. Use your leftover turkey to create something entirely different and have everyone in your family wondering where all those leftovers went. Use your turkey to create delicious dinners like Turkey Pot Pie and Turkey Tetrazzini. Have left over mashed potatoes? Combine them with some of the remaining turkey to make Turkey and Leek Shepherd’s Pie. Normally, most kids turn their noses at the thought of leftovers, but with a little creativity and some of these great recipes, you can make things from your Thanksgiving leftovers that even the kids will love. Use leftover mashed potatoes to create a plate of Crispy Potato Cakes. Make a delicious dinner of Turkey Lasagna. Fill their plates with Cheddar Stuffed Turkey Burgers and Crispy Sweet Potato Fritters or Leftover Mashed Potatoes for a fun meal filled with kid-friendly flavors. 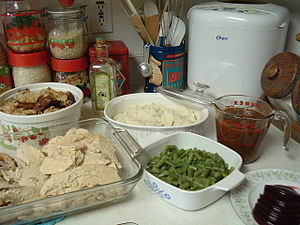 If you have a favorite dish you like to make from your Thanksgiving leftovers, please share it with us! We would love to add your recipe to our collection of favorites on Fill Your Plate! This entry was posted in Holidays, Recipes and tagged Chili, Cook, Cottage pie, Leftovers, Mashed potato, potatoes, Soup, Thanksgiving, Thanksgiving Dinner, Turkey, turkey pot pie. Bookmark the permalink.